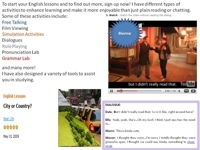 Learn English Online with teacher Bienne. I handle Beginner, Intermediate and Advanced Level students. I teach Listening comprehension, conversation, pronunciation, grammar, idiomatic expressions, phrases and current issues. I train my students learning TOEIC, TOEFL and IELTS interview, speaking and written exams.